Quiltville's Quips & Snips!! : A Cabin Meant for Dreaming.. The part of the cabin that juts out a bit, forming the covered side porch roof? That’s the window to the master bedroom. You can barely see the west ridges in the right of the photo – those are the ones that will be hidden from view as soon as trees get their full leaf regalia. I did some mighty weird dreaming last night! It was weird enough that I can’t stop thinking about it this morning. It involved ME riding on a very antique bicycle, evidently getting myself to my workshop a bit late. No matter, the ladies were already deeply involved in the applique that went with their projects, so deeply involved that they barely gave me a second glance, even if I was huffing and puffing from riding this clunky antique bike and arriving at class a bit late. In the time it took me to turn around after putting my stuff down, I found everyone napping on pull out sofa beds in sleeping bags. It was at this moment that I realized I forgot to write this morning’s blog post because I was so busy with that clunky bicycle. I really did awake laughing. Number One…I do NOT teach applique workshops! LOL! It was turning around to find EVERYONE asleep in sleeping bags on pulled out sofa beds that was a crack up! Where was I holding this workshop? The Furniture Barn? LOL! And I think H#LL would freeze over if I ever “forgot” to write a blog post. Unless it’s a giveaway drawing time evening one. Maybe. What is it that plants the seeds for our dreams? This was a weird one! Often times I can remember bits and pieces of dreams, but this was so vivid. Just keep me away from bikes for a while! It is a GLORIOUS day today! The wind has gone, and I am hoping….if I can stay up here long enough…to do some treadling on the porch today. I was planning on going home by lunch time, but I think I can push it a bit later. Remember that red string bin that I have been digging in for variety? I remembered a deadline. Um. Yes. I did commit to something. And I used some of the time to do some kitting up so these parts are ready to go with me on my trip to Naperville for the Cocoon next week! I'm heading up a small quilt auction to benefit Quilts of Valor Foundation. 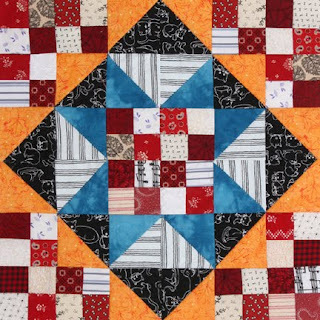 There's a full-fledged consumer show in Des Moines in late May focused on QOVF, and the silent small quilt auction is one of the features. I serve on the QOVF Board of Directors, and this auction was my idea, so I'm doing the asking. My daughter Mary and I worked on the invitee list. The quilts are to be no larger than 30 x 30. The theme is "America the Beautiful." Thank you for considering this and please let me know right away if you'll participate, okay? Did you catch that? DUE MAY 15!!! And of course I said YES. I'm in. All in. This is my plan. I’m taking 4 Winston Ways blocks, setting them side by side, and adding a couple of borders around them. It will give me a quilt that is 30” square. It's patriotic. It will be easy to do, and it will be FUN. It will also give me something that I CAN share here with you! Do you want to make a small Winston Ways 30’’ quilt with me? There are several sources for this pattern. If you don’t have MORE Adventures with Leaders & Enders, you can find the block in Vol 3 of 100 blocks by 100 designers. My block is #279. It’s found on page 65. This block is also included in the 1000 blocks by Quiltmaker Magazine book. It is # 647 on page 331. Because we are starting now, and this has to be turned in by May, you’ll have it ready by Memorial Day and it can stay up for Flag Day, for 4th of July in all of its patriotic goodness. While *I* am sending in this quilt for the celebrity quilt auction, you get to keep your own quilt, or donate it somewhere else if you want to, but the fun part is that we can be working on these together! Or make it in your own colors. It’s only 4 blocks for a 30’’ quilt. It will be fun! I did a search on Pinterest to see other colorways HERE. Tray loaded with hunks and chunks. Strips with margins removed! Perfection! I am often asked about the waste when working with the Accuquilt studio (same applies for the Accuquilt go). No. There is no more waste than you would find with ordinary rotary cutting, but I can easily cut through 10 to 12 layers with the studio. If I were to use shape dies, there might be a bit more waste, but I mostly use my cutter for strips and some triangle units. I can easily use specialty rulers to cut matched pairs from strip sets once my strips are cut down to size. I probably do more strip cutting than anything else with the studio. I was left “home alone” at the cabin last evening. The Hubster had to return home for work, but I wanted to stay just a bit longer. This is the benefit of having two cars up here! We can come and go as we need to. I wanted to spend some time treadling to “Midsomer Murders” on Netflix, and I had a perfect view of the TV because the treadle is right behind my comfy chair. It might be weird to some, but function trumps aesthetics or feng shui hands down any day! You can see that I have marked parallel lines perpendicular to the blades on the die with a silver sharpie. Got to keep things lined up so I don’t end up with a bunch of parallelograms! By this time it was nearly 10pm and I just didn’t have it in me to sew any further. These pairs will give me enough for the blocks, and the border surrounding the whole little quilt! Just because I didn’t feel like sewing, didn’t mean I couldn’t keep cutting for the rest of the project! I chose blues and neutrals for the star points, blacks and golds for the other half square triangle units and I am good to go! I’m looking forward to sharing my progress on this with you over the next while! Remember, we are shooting for Quilt-Cam tomorrow night, Weds March 30th at 9pm Eastern. Put it on your calendar, set the alarm on your phone, and get a project ready so we can spend some time together. I admit it. This is something I have to tell myself nearly every single day. Working hard and pushing yourself to the limits doesn't mean you can't also be kind and gentle with yourself. Keep the focus away from your failures, and put it on your progress! Vintage quilt found by my amazing friend Irene in Louisville, Kentucky. Thank you, Irene! Happy Tuesday, everyone! What will you do with yours? Your quilt for the QOV will be great! I may pull some fabrics and make a small one too...though I may need to make it lap or wheelchair size for the VA who is asking for more quilts again! Oh, I can so see a "barn quilt" or 2 on your beautiful cabin! Winston Ways is on page 331 of 1000 Blocks. Thanks for the Block suggestion. I am finishing the binding on a very special quilt for my Marine SIL and also want to make a QOV quilt in his honor. What a great way to use up the scraps. Have a good day and "sweet dreams ". I dreamed my dad was sitting in a room with his hair all in tight little braids with ribbons on the ends. He had on an old brown wool plaid jacket and he was entertaining a bunch of children who were giggling and laughing at him. I tried to say "hi dad" to him but he shushed me. It was hilarious and so like something my dad would have done in his life (sans the braided hair). The dream was much more involved and also involved a bicycle. Who knows why we assemble these odd things to make us wake up laughing. I miss him so, it's always fun to see what he's up to in the next plane. I'm sure he keeps the angels laughing. Winston Ways is one of my favorite quilts I made from your patterns. Keep up the good work and thanks for all the wonderful words of wisdom. What is this about dreams? Last night, I dreamt that I was driving the car from the back seat, and our dog Molly (golden doodle about the size of a house) kept getting in the way. I could make 4 blocks for a small quilt. I love patriotic quilts. Weird dreams. Might be from watching the Mystery. I knewyou don't do applique in your workshops. That might be something fun for this next Mystery Quilt. Lol just to remember that Dream. As the wife of a veteran of WWII, Vietnam, and Korea, I think this is a great project for QOV. Would we all be sending them in for the auction, or only yours Bonnie? That was a fabulous dream! The vivid ones stay with you and pop up again from time to time. I used to dream repeatedly of being able to breathe underwater...joyous. The dream never returned after I became a scuba diver. Winston Ways is on page 331 of the Quiltmaker's 1000 Blocks book. a post filled with goodies! love the quote...going to keep repeating it to myself! I'm sewing the binding on a full-sized QOV while recovering from knee surgery. Been 10 days now. I think I'll be able to run the machine by next week. Because it's my right knee it will be a lot longer before I can drive though - sigh. What a strange dream! I think it's cool you are using a treadle sewing machine. I've been dreaming about seeing you at the Grand Hotel in my dream I brought my piano and my dog along. Maybe I should pack lighter ? Yes yes I want to! Them dreams...sometimes they are just so real. Red I love orange first, but I also love red. How exciting!!!! You are having separation anxiety from shamu and trust issues with new car? I think you're just tired and hope your students will nap instead of being so dang hyper excited to see you. Ha ha oh gosh. Maybe you long for a change and want to learn appliqué in the near future. Or maybe it's just a dream. I sure have weird ones. I call them "working dreams"; always solving problems, or trying to. Always in a hurry and fixing this or that, or trying to. Always difficult, like you in bicycle. Work, work, work. I don't have them as much as I use to when I worked. I think it's normal. Gorgeous day on this side of smokies by lake Fontana, have a fire. Sunny and gorgeous but a chill. For those asking, only *I* am sending in this quilt for the celebrity quilt auction. I should have clarified that. You get to keep your own quilt, or donate it somewhere else if you want to, but the fun part is that we can be working on these together! Bonnie, I read your post this evening , I usually read it in the morning before I go to work, but I overslep, alarm did not go off. Years ago my therapist, who was a Jungian analyst, said you pick the things that are most prominent or significant in your dream and free associate what those images represent or mean to you, i.e., bicycles can be travel, in this case an old form of travel, or something from your childhood, etc; the applique something you don't do, don't like to do, always wanted to do, something you view as too slow and tedious for you to do, etc. So it could be that there's something new you need to try or something you need to stop doing because it's getting in your way or slowing you down. It's like unraveling a puzzle. Or you can just forget about it and get your blocks done!!! Bonnie, Love the quilt block. as a Vietnam vet I want to thank you for donating that quilt to support the QOV program. I like the Jungian analysis but I was wondering if treadling could suggest pedaling? Thanks for sharing, it makes me want to have one of those dreams that you puzzle over to figure out what's in my mind - but not too often. I also appreciated the die cutting example. I need to make some more marks on my Go strip cutters and cut the sewn and paired strips. I got a good laugh out of your dream, strange and funny!